We celebrate Christmas and exchange gifts while still trying to remain true to a reasonably simple, low-consumption lifestyle. It can be be so easy to get swept up in the hype. This year I am doing my bit for the environment by shunning the wrapping paper and choosing to make reuseable cloth bags from Christmas fabric which I bought in the sales last year. 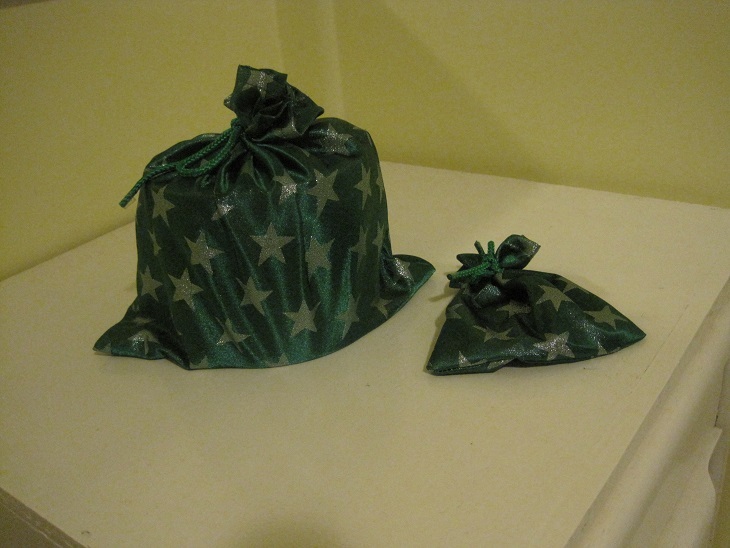 Here are a couple of gifts already packaged. I have made a range of sizes in a few different fabrics. It will be good not to be collecting up armfuls of ripped wrapping paper to go in the recycle bin on Christmas morning.